Many devotees of Sai Baba know that the revered saint had lived in Shirdi between the nineteenth and twentieth century. Facts about his origin are still unknown to many, but this Indian spiritual guru had laid greater emphasis on the principles of faith and compassion. While preaching, he used sayings that were short and in layman's language, which listeners easily understood. This holy saint led a simple life, taking shelter in a ruined mosque and sleeping on the floor. His simplicity and compassion attracted many people to him, and there were several pilgrims who arrived in Shirdi to seek the blessings of this holy saint. He is also believed to have performed some great miracles for alleviating the suffering of his followers. Soon, the news about miracles of Shirdi Sai Baba spread far and wide, attracting the attention of people across various regions. Many people travelled longer distances to reach Shirdi and seek the blessings of Sai Baba. Several individuals have stated that the earliest miracle of Shri Sai Baba was that of lighting lamps in temples and mosque with water. 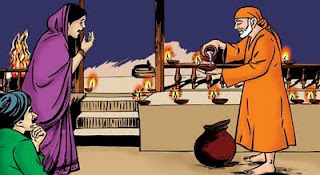 Shri Sai Baba used to light earthen lamps in the mosque and other temples that make up the entire temple complex today. For this purpose, he had to procure oil from grocers of Shirdi. After some time, they refused to provide him oil stating that they had no fresh stocks of it. Without saying a word, Sai Baba returned to the mosque and lit the lamps after pouring water in them. Another miracle was performed to extinguish a fire that had threatened Kondaji Sutar's corn fields. Baba had only sprinkled a few drops of water and the huge fire got extinguished immediately. Once, a couple had come to seek blessings of Shri Sai Baba, but were unable to leave due to heavy rain. The holy saint invoked God and prayed for the rain to calm down, and to the couple's surprise, the showers stopped. Another incident from the stories of the great miracles of Shirdi Sai Baba is increasing the water level in a well. This event occurred when the villagers wanted to celebrate Baba's birthday and there was a severe water crisis in Shirdi. He put some leaves into the well and its water level rose amazingly, taking the entire village by surprise. Among his other miracles are saving of a three year old from drowning and making water flow from his feet. Every year, millions of pilgrims and tourists arrive in Shirdi in order to visit the shrine of Shri Sai Baba. Some of them are quite familiar with the miracles of Shirdi Sai Baba and hold this revered saint in high regard. While on a pilgrimage to Shirdi, many of them are in search of excellent hotels that would enable them to have a comfortable accommodation. For a memorable stay while on a visit to Shirdi, devotees or tourists can book an accommodation in Shirdi Hotel Sai Sahavas, which is just five minutes of walk away from Baba’s holy shrine. 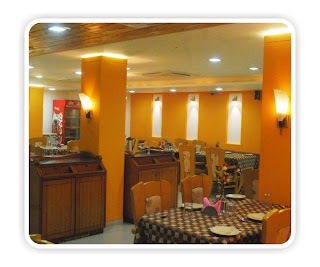 Among its facilities are comfortably air-conditioned rooms and a multi-cuisine restaurant that serves vegetarian food including local, North Indian, Gujarati, South Indian and Chinese delicacies. A stay in this hotel provides a great deal of convenience for guests in visiting other holy places located close to Shirdi. A wonderful shrine built over the tomb of revered saint, Shri Sai Baba, Shirdi Sai Temple is visited by numerous devotees every year. According to legends, this holy saint arrived in Shirdi at the age of sixteen and remained there till he breathed his last. His body was laid in Samadhi Mandir, the temple that still exists today and attracts plenty of pilgrims. Even years after his death, the teachings of Shirdi Sai Baba have always remained with his devotees. His messages of love and devotion have great relevance in today's times. Many pilgrims arriving in Shirdi for seeking the blessings of Shri Sai Baba are always on the lookout for a comfortable place to stay. The Shirdi Sai trust has done an excellent job in constructing 'Dwarawati Bhaktiniwas', a complex that consists of 334 rooms, dormitories and large rooms to house small groups or big families of about ten members. Parking space, power supply with generator back-up, a 24-hour water supply and security are some of the facilities provided in this complex. This shows the commitment of this trust towards devotees of Shri Sai Baba who are looking for an accommodation in Shirdi during their visit to the temple. But, despite all the elaborate arrangements, all rooms fill up in peak seasons and some devotees have no other option but to search for accommodations elsewhere. Some pilgrims who are travelling with their entire families always require rooms in Shirdi that have all the desired facilities essential for a memorable stay. In recent times, people can have many choices in hotels which enable them to select one that suits them the most. Though there is no dearth of them in this town, many hotels in Shirdi near temple may not have the adequate facilities. 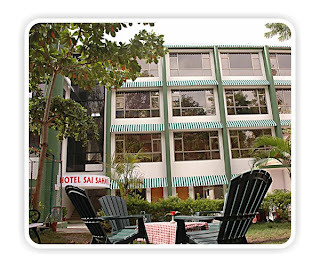 Just 5 minutes of walk away from Shirdi Sai Baba Temple is the fabulous Hotel Sai Sahavas. Most of the hotels with rates that are charged unreasonably would not match the kind of facilities provided in this hotel. Along with several air-conditioned rooms equipped with modern facilities, it also has a replica of Shri Sai Baba's shrine on its third floor.